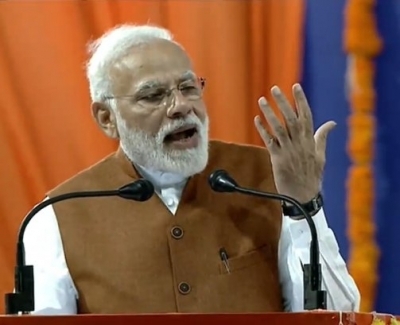 Hubballi, Feb 10 (IANS): Prime Minister Narendra Modi on Sunday evening unveiled various development projects in the twin cities of Hubballi and Dharwad. Karle Sabkuch Udghatan stone , aour sirf 10/12 din bacha hua hai uska bhi . Ye sab to kuch karna nehin hai . Uska bahane public ka paisa se election campaign bhi ho raha hai . KAHAN GAYE THE 4.5 YR SE . Ajj tak IIT IIM AIIMS banke bache pass bhi kar chuke hote . JHUT Main hamara PM dunia ka professor hai . One honest man versus 15 corrupt dynastic politician's. People, decide for yourself whom you want. Think about it carefully when you vote. u say honest. chaiwala& his troupe r da most corrupt. demonetisation corrupt. g.st. corrupt. rafale corrupt. no developments becoz all developments corrupt. how come bjp is richest party????????? jeshodaben is richer than sonia madeam & queen elizabeth. chaiwala is 1nly lunching & launching. people r punching. dis time he will c all black flags. Generate employment..Collect Tax and improve the nation..no one NETHA is going to put from his pocket. Best quality education..job oriented. Education to all. build best SMSE and heavy industries.. Build infrastructure ..rest the people will manage . This is no nuclear science. Let no Netha take credit of developt. Even if you are a Leader ..this is what you need to do.. So, simply build the nation.... by building the people..the families.. society..community..
no more GOSSIP...NO MORE Corruption..no more Talking but like the Chinese act..work.. hard. Earn and pay .with this tax LET GOVT BUILD THE NATION.. So, the credit should go to the SOVREIGN PEOPLE. One side Horse trading, other side launching projects, that may never materialize. May be fed up with failed operation lotus. Now trying to make operation karnataka. Did he inaugurate project horse trading. GREATEST PRIME MINISTER OF INDIA. Everyone should vote this great man. Imagine this Bhel Puri parties coming to power? Great man because he comes everywhere to cut the ribbon of inauguration. But never dares to open his mouth to condemn so many repeated incidents of mob lynchings by Chaddi assosiated gangs. I don't know how the tongues of people function to praise this great man. If you remove your 'Pappu' brand glass and start to wear 'Common citizen of India' brand glass everything will be Cristal clear that India is Progressing at greater speed than 55 years Congress rule vs 4.5 years Modi rule with less terrorist attacks and greater communal harmony. Can you clarify in what way india's is progressing. Protecting cow instead of girls and women who are getting raped. Providing budget needs for cows than for human beings. Using schools to shelter cows. U need treatment. Various projects to fool innocent voters..
What happened to his Rs. 15 Lakhs, what happened to his Acche Din, what happened to 2 Crores job for youth, what happened to make in India, start up india, stand up india, what happened to Beti Padao beti bachao, all gas ballons. Let him first show his education qualification. He lied about his marriage but when the clause was put in the EC application, the truth came out. He destroyed India in 4 years and 9 months. It will take 25 years to rebuild it. Can you tell me what he has done more than enough. Of course he has lied enough. He lied about his marriage he lied about his education qualification is that not more than enough. Watch again the 100 minutes speech in parliament few days back but without your puesdo secular glasses. There is nothing regarding cow welfare. without cow kalyan the project is waste. Stop lying ..You cant create a promise and then say Modi failed to deliver. Wonder why a section of people doesn't have the brains to get into IIT..